Topps has finally releaed Volume II of the Wacky Packages Coffee Table Book This book features Series 8-14 from 1974-75. Hardcover with dust jacket, measuring 5 7/8" wide, 7 1/2" high, 1" thick, 240 pages, 1 lb 3 ounces. Special introduction by legendary Wacky Pack artist Jay Lynch. Jay Lynch has been involved in Wackys since the 60's conceiving over half of the 70's Wackys and he has a keen perspective on the genre. The book features pictures of all stickers from series 8-14 (they are just pictures not actual stickers). 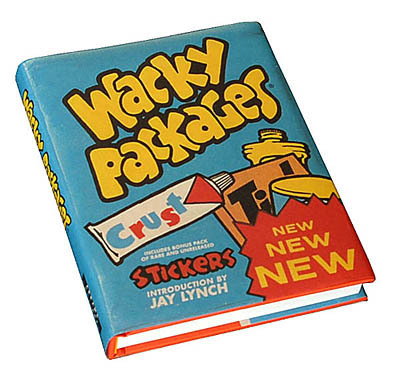 Also included are four never before published "Lost Wackys" (actual stickers) exclusively available only with this book. The book retails for $19.95.